¡Orale! Did you know that Santa Claus has a Mexican cousin? ¡De veras! Pancho, young Vincent’s tío, is Santa’s primo! He can speak Spanish and English and sings like a mariachi. Pues, Santa is getting older, the border along the Río Grande is too long—and he needs help. So when Pancho agrees to help his primo deliver gifts to all the children living in towns on the US-Mexican border, his raggedy, ill-fitting mariachi outfit is transformed into “a gold jacket with matching sequined trousers, rattlesnake-skin boots with silver spurs, a big sombrero covered in gold sequins and blinking Christmas lights, a great big cape and a golden mask.” He becomes—¿estan listos?—the great Charro Claus, and his nieto,Vincent, who jumps out of his tío’s magic sack of presents, becomes Charro Claus’s assistant, the mask- and cape-wearing Tejas Kid! With their broken-down wagon turned brand new, a sack filled with magic dust, and their incredible Flying Burritos—decked out in lucha libre masks and tiny capes—suddenly rising up in the air, Charro Claus and the Tejas Kid are off! And, on this particular Christmas Eve, on this magic night, nothing can keep the two from delivering toys to all the children who live along the border. Garza’s expressive characters, in bold, full-page, graphic novel-type illustrations, heavily saturated and thickly drawn in acrylic on paper—and his warm, bright palette of mostly reds and oranges with dark blue star-lit skies—will easily draw young readers into the magic of the story. I’d like to see every child living in the towns on both sides of the outrageous, forbidding, miles-long barb-wired fence—and especially, every refugee child held in the border-town detention centers—own a copy of this book. They could all use a little magic, right about now. 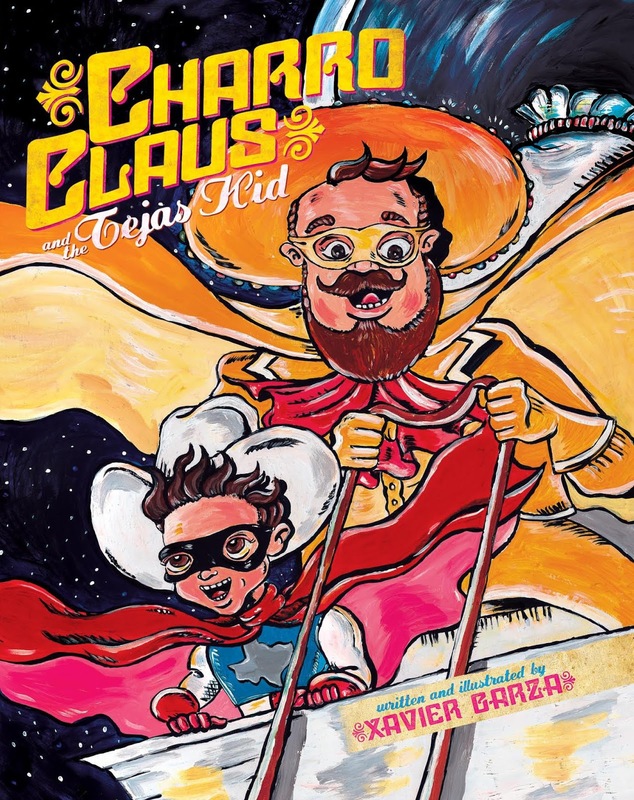 Charro Claus and the Tejas Kid is highly recommended.